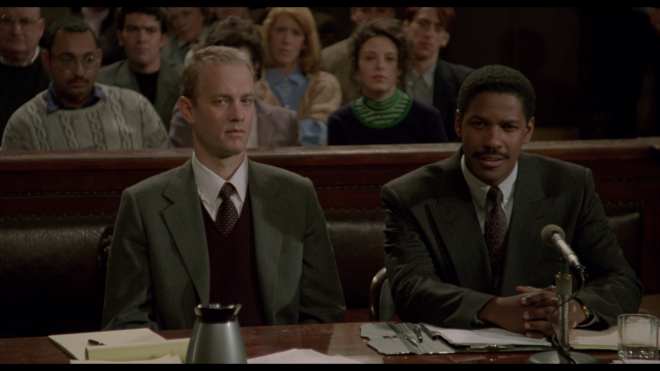 Celebrating its 25th Anniversary, Jonathan Demme's Philadelphia remains a powerfully poignant, gut-wrenching courtroom drama that brought public awareness to an important subject matter and features memorably moving performances by Tom Hanks and Denzel Washington. The now-classic film marches into the halls of 4K Ultra HD with an exceptional HDR10 presentation and a strong Dolby Atmos soundtrack while offering one brand-new bonus along with the same set of supplements as previous releases, making this UHD edition Recommended. 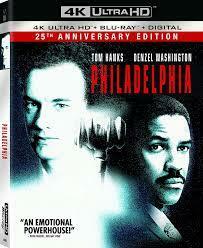 Philadelphia marks a momentous, pivotal departure in the career of Tom Hanks. Prior to his Oscar-winning performance as Andrew Beckett, the former Bosom Buddies star made a name for himself as one of the best funny men working in the 1980s and into the early 90s. At the time, audiences only knew him from successes like Splash, Big, Sleepless in Seattle and A League of Their Own, which now, looking back, exhibited hints of a talented Thespian masked behind the clown. Nevertheless, playing a former lawyer wrongfully dismissed from a prestigious law firm for his sexual orientation and for contracting AIDS came as an interesting, surprise choice. And twenty-five years later, Hanks' portrayal of a man forced to hide from society an important aspect of his life remains one of the actor's most memorable and powerful performances. It is amazing to watch him carry the heavy burden of discrimination and bigotry in the subtlest and most understated facial expressions. 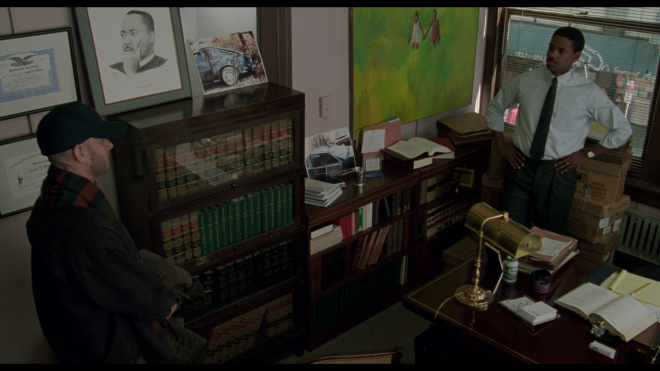 Early on, director Jonathan Demme allows Hanks the opportunity to display this emotional pain when walking out the law offices of Joe Miller (Denzel Washington). In a courtroom drama often cluttered with blatantly-pretentious camerawork and some rather ostentatious cinematography, this simple, uncomplicated close-up of Hanks' face is a not only greatly appreciated but also poignantly powerful. The long-take shows people walk past Andrew, desperately fighting to hold back the tears and feeling ignored by the City of Brotherly Love, a man on the brink of losing complete hope in humanity. And the effectiveness of this gut-wrenching moment is ultimately thanks to Hanks, which he carries with him for the remainder of the film. Even when surrounded in a crowded courtroom of supporters, there is a continued sense of living in isolation and feeling segregated from society, the weight of being treated a pariah taking a visible toll and conveyed on his pathetically sullen face. 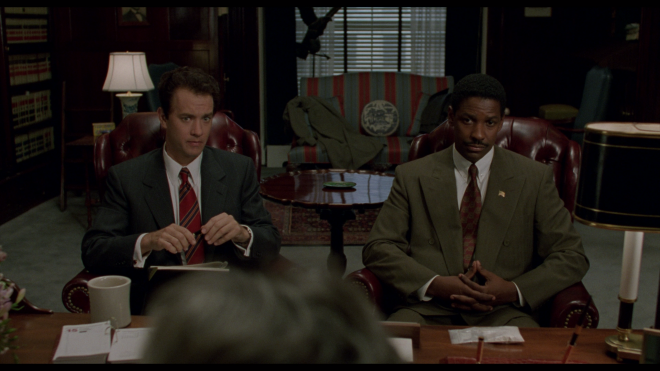 Part of Hanks' support system is Washington, who also delivers a powerfully moving and memorable performance as a lawyer rediscovering his passion for the law and fighting for the underdog. In this "David and Goliath" tale inspired by two real-life court cases, Washington's cliché ambulance-chaser essentially represents us, the majority of society with limited knowledge and little experience with the terrifyingly fatal virus and the community it stereotypically effects. Joe's initial introduction is sitting side by side with Andrew and on an equal level, yet the two approach the law from vastly different and opposite sides. Ron Nyswaner's script has them doomed to meet in the middle, but he smartly gives Joe time to grow from his bigotry and learn about his privileged perspective on this important subject. In accepting the case, Joe is suddenly reminded of his own struggles with injustice and society's intolerance and fear of the "Other," which like Hanks, Washington portrayals in some subtle, mostly nuanced expressions. Aside from the still-magnificent performances of the two leads, Philadelphia endures as an important piece of American cinema. The film will be remembered not only as one of the first mainstream Hollywood productions centered around a homosexual protagonist, but it will also live on as the first from a major studio to candidly tackle homophobia and the devasting effects of AIDS. Revisiting the film with an understanding of how far we've come twenty-five years later, the plot doesn't exactly address these important issues in any significantly challenging way, preferring to play it safe by limiting intimate scenes between Hanks and Antonio Banderas, who plays Andrew's partner Miguel, to one romantic dance. However, it brings awareness to the discussion with the seriousness and weight it deserved at the time. And although Demme's heavily-stylized camerawork can occasionally distract from the subject matter, the film remains a harrowing and touching tale about fighting intolerance. Sony Pictures Home Entertainment brings Philadelphia to Ultra HD Blu-ray as a two-disc combo pack with a flyer for a Digital Copy, which can be redeemed via sonypictures.com and MoviesAnywhere. Only, users have access to a 1080p HDX copy with 5.1 Dolby Digital audio. The dual-layered UHD66 disc sits comfortably opposite a Region Free, BD50 disc, and both are housed inside a black, eco-cutout case with a glossy, lightly-embossed slipcover. At startup, the disc goes straight to an interactive main menu that changes screens when switching between the usual options while music plays in the background. 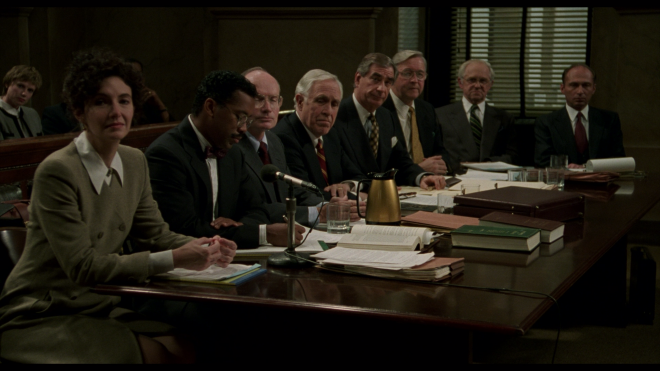 The courtroom drama fights the system in the Ultra HD halls of justice and faces a cruelly judgmental tribunal with an exceptional, highly-talented HEVC H.265 encode, and the verdict is in. Fresh from a brand-new remaster and restoration of the original 35mm camera negatives, the 2160- transfer marches in with outstanding definition, besting its Blu-ray predecessor nearly every scene. From the fine stitching of clothing and the tiny fuzzballs on sweaters to the minute architectural features of the city and the small background particulars of the courtroom, the picture is consistently razor-sharp and detailed with several shockingly striking moments. However, as would be expected for a 25-year-old film, there are a few segments sprinkled throughout that are softer and blurrier than the rest, and there's evidence of very mild, easy-to-ignore aliasing along the sharpest edges. Nevertheless, this is a spectacular upgrade, showing lifelike textures in the entire cast that reveal every pore, wrinkle and blemish. The 4K video also arrives with better and more dazzling contrast than before, making the entire movie feel fresh and look pretty stunning throughout. Whites are noticeably sharper and far more dramatic, making the fluffy clouds pop with eager brilliance and the creative lighting in the camerawork glow with intense luminance while at the same time, remaining faithful to the artistic intentions of the filmmakers. Viewers can also appreciate the tighter, narrower specular highlights, allowing for better clarity within the hottest, brightest spots while giving metallic objects and the edges of varnished wood furniture a bright, realistic polish. Black levels offer another dramatic improvement, looking significantly richer and silkier without ruining the smaller details within the darkest corners. Awash with a very fine layer of natural grain, the 1.85:1 image has a lovely film-like quality from beginning to end. 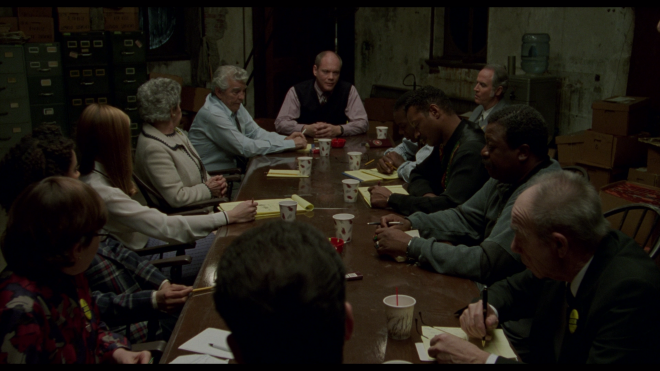 Audio Commentary: Director Jonathan Demme is joined by screenwriter Ron Nyswaner for a somewhat informative but also a bit dry conversation on the production's technical aspects. Their conversation mostly revolves around the cast, the performances and the role of Bruce Springsteen's song while also touching on the plot's themes and their aspirations. Featurette Teaser from (RED) and Coca-Cola (HD, 5 min): This brand-new featurette is essentially a trailer for the company's documentary short, titled "The Last Mile," on the progress and continued fight against AIDS since the film's original theatrical run. Recent cast and crew interviews reflect on the film's social impact and lasting legacy as part of that fight. One Foot on a Banana Peel, the Other Foot in the Grave (1080i/60, 79 min): Originally from the 2004 DVD release, the Demme-produced documentary focuses its attention on the daily lives of HIV/AIDS patients going to clinic visits for treatment while listening to their tearful struggles and challenges living with the virus. People Like Us (1080i/60, 58 min): Also from the same DVD release, this making-of doc is pieced together mostly from cast and crew interviews, as well as tons of BTS footage, focusing on the various technical aspects of the production, the plot's themes and background on the controversies, the performances and the film's lasting cultural impact. Making of Philadelphia (1080i/60, 6 min): Borrowed from the Twilight Time release, this is the original EPK piece with interviews and BTS footage on the production. Courthouse Protest Footage & Interviews (1080i/60, 4 min): Upscaled faux-newscast footage dramatizing the public's reaction and backlash to the lawsuit. Music Video (1080i/60, 3 min): Bruce Springsteen performs the Academy Award-winning original song " Streets of Philadelphia." Joe Miller's Macready & Shilts Legal Services TV Spot (1080i/60, 1 min): Again, ported over from the DVD, the faux commercial features star Denzel Washington as Joe Miller. Twenty-five years ago, Jonathan Demme's Philadelphia stirred quite the controversy by being the first major Hollywood production to feature a homosexual character as the central protagonist while tackling the hotly-contentious topics of homophobia and AIDS. Revisiting the film and considering how far we've come since then, the filmmakers played it fairly safe and consciously made the effort not to "offend the audience." Nevertheless, with memorably moving performances by Tom Hanks and Denzel Washington, the film remains a powerfully poignant, gut-wrenching motion picture that brought public awareness to an important subject matter. Celebrating its 25th Anniversary, the courtroom drama marches into the halls of Ultra HD with a confident and exceptional 4K HDR10 presentation that easily bests its HD SDR counterpart and sings a tearful tune thanks to a strong Dolby Atmos soundtrack. Porting over the same set of bonuses from previous home video releases along with one brand-new supplement, this UHD edition is recommended.